Local partners working together to conserve and restore salmon habitat. It's Salmon SEEson again! Stop by our suggested salmon viewing sites this fall to catch site of salmon returning upstream to spawn. Puget Sound's resident orca population is in trouble. Here are some actions you can take to help salmon and the orcas that rely on them! Looking for salmon at the Ballard Locks? Their new website provides up to date information on viewing and renovations. Part 6: Threatened Chinook Face Final Obstacle at Landsburg Dam Before Reaching "Shangri-La"
Chinook salmon (also known as king salmon) are listed as threatened under the Endangered Species Act. In WRIA 8, citizens, scientists, businesses, environmentalists and governments are cooperating on protection and restoration projects and have developed a science-based plan to conserve salmon today and for future generations. 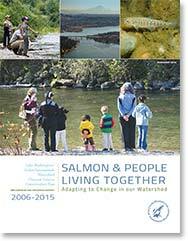 Funding for the salmon conservation plan is provided by 28 local governments in the watershed. 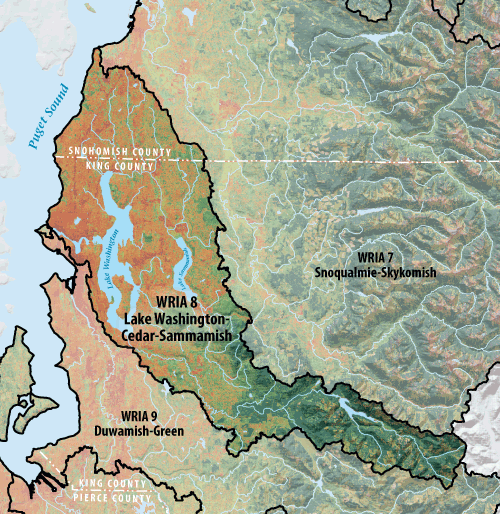 Salmon recovery in WRIA 8 is organized around the needs of two distinct chinook populations - Cedar River and Sammamish River - as well as the migratory and rearing corridors used by those populations. While particular actions may differ among those recovery areas, certain theme hold true throughout the watershed. For example, watershed-wide priorities include protecting forests, reducing impervious surfaces, managing stormwater flows, protecting and improving water quality, conserving water and protecting and restoring vegetation along streambanks.